Light a lamp of hope! Fire a flowerpot of happiness!! 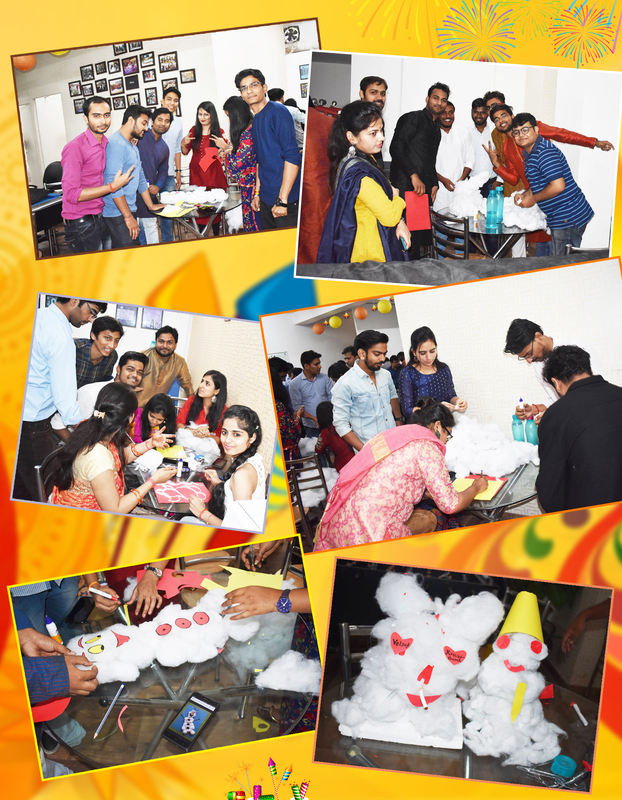 Diwali has always been celebrated with full enthusiasm and zest at Velocity. After celebrating 3 consecutive years, this was my 4th Diwali in the company and wasn’t any lesser. Velocity was decorated with the most beautiful flowers, colorful lanterns, fairy lights and so much more. What made it more beautiful was the Rangoli made by the women employees. It was indeed a great start of the festival of lights. As a customary, the Velocitians dressed in the best ethnic dresses as a part to look alike and unite in the celebration together. Dressed in their best and with their smiles intact, they posed for the shutterbugs throughout the morning individually, in groups and so much more. Last year, we went to Glued for celebrating Diwali together but this year, we kept it in the campus itself. Well, you can see the photo session down below. Chatting and doing a few tasks, the entire company was patiently waiting for the celebration to start. (Well, that’s exactly what happens when we all know that there’ll be a pompous day with food that’s going to be the talk even after Diwali and its festivities gets over). As soon as the time came, we were all set to head for lunch that was no less than a good restaurant buffet with lip-smacking food options served in front of us. With Paneer butter masala, mix veg, dal makhani, dhokla, puri, vegetable pulav, salad, papad and more. What celebration would be complete without desserts? So, we had Baalu Shahi and Gulab Jamun to serve the sweet-tooth. Finally came the time of the celebration where the very first task was to find the other pieces of a picture depicting movie names like Bambi, Bheem, Angry Birds, Kung Fu Panda and more. Every participant got a piece and they were supposed to find the other pieces and winner was the team that completed their picture first. Finally segregated into their teams, the game started where the teams had to send an individual to represent their team and pick a chit from the box and do the weirdest of dares mentioned in the same. While some sang songs, gave kisses, danced on the old melodies, some had to act crazy and do so many things. After several rounds, the next and the innovation-inspired game came on. Every team got cotton, glue, two sheets of colored paper, a pair of scissors and pens; and they had to craft anything from the given material. The team got their minds and hands on their mission to complete what they started and the outcomes were both hilarious and innovative. The winner was clearly a winner with the creativity and teamwork in making Olaf, from the movie “Frozen”. The other team’s hard work was also appreciated for sure. The celebrations concluded with Manish sir clicking photos of one and all in groups and pose for some as well. As we departed, the gifts and the sweets were distributed to each employee and we called it a day.